FCI Delhi Recruitment 2019: The Food Corporation of India in all the states is responsible for watching over the proper food preservation and its distribution. The candidates who have passed their middle school level education are offered Delhi FCI Watchman Recruitment 2019. As per the notification, there will be various vacancies for watchman posts. Those who are interested in Government Job to read all details of the vacancy can follow the detailed FCI Delhi Recruitment 2019 Notification given in the article. The last date to apply for the vacancy will be updated. To know more details such as eligibility, application, and selection process read complete article. Latest Update: FCI will soon release the Delhi Watchman 2019 Recruitment Notification for various vacancies. Interested & eligible aspirants apply the Watchman online application form before the last date from here. Food Corporation will be released a notification for watchman vacancy in Delhi region to fill up the Vacancies. The Food Corporation of India will be released the notification which is suitable for all those candidates have a minimum required education. According to the FCI Delhi Watchman Vacancy 2019, the post is also suitable for physically challenged candidates up to 40%. There are only a few days left hence the candidates are notified that they should not miss the chance and read the FCI Delhi Apply Online 2019 guidelines and procedure given below. All the interested candidates will be able to submit their application properly only if they are given all the required details in the easy format. 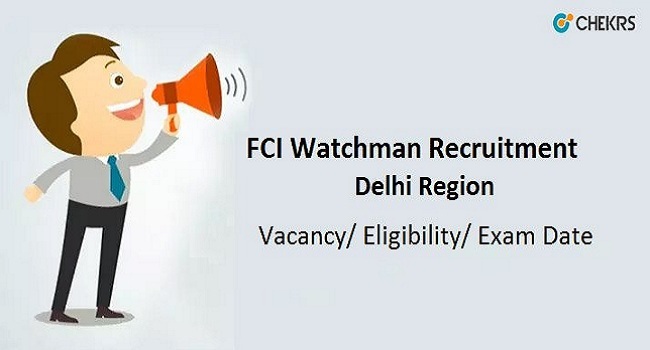 Here we have summed up the important details of FCI Watchman Delhi Recruitment 2019 in the tabular form. This is a very good chance for all the candidates interested in government jobs. The candidates with a suitable profile are altered and informed to apply as soon as possible as only a few days are left. No offline Delhi FCI Application Form 2019 will be accepted. Hence the candidates are requested to follow the proper procedure as given below. Here we have also given a direct link to which the applications can be submitted easily. The minimum age limit given for the candidates is 18 and maximum of 25 years. Candidates belonging to reserved and PWD categories can get age relaxation for up to 15 years. The monthly salary of selected candidates will be 8100- 18070/-. The candidates belonging to General and OBC category will have to pay FCI Application Form Fee of Rs 250/-. SC/ST/PWD/Ex-servicemen or Serving Defence Personnel are exempted from the application fee only after the submission of relevant documents. The candidates can apply for the vacancies through the following given steps. Scroll down the page and there will be an activated link of Apply Online. Click on the ink and online application form will appear. Fill all the fields with correct information and attach required documents. Click on the option of preview and recheck it. In the written test the candidates will have to answer 120 multiple choice questions. The performance will be judged collectively on the written test and physical endurance test. To get selected start you can prepare from now on. To ask questions about FCI Delhi Recruitment 2019 to us keep commenting in the section below. You can follow jobs.chekrs.com to get everyday updates for the post you have applied for.